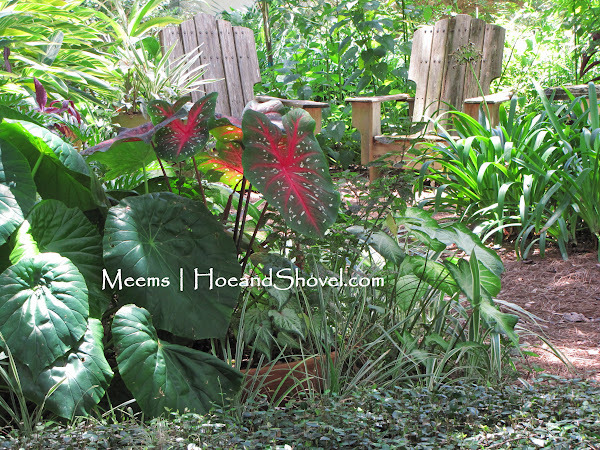 Steamy, hot Florida summers are the ideal environment for caladiums (Caladium x hortulanum). Actually, the warmer and muggier it gets, the better caladiums perform when widely used as an ornamental in the landscape. They are part of the Araceae family and originally from the Amazon basin of Brazil after all. 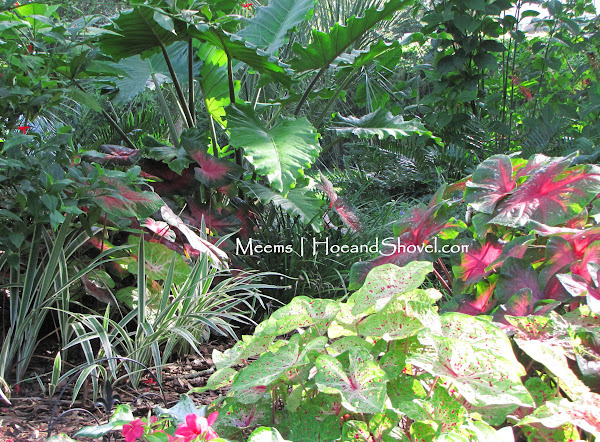 My summer garden comes alive with colorful caladium leaves to enhance existing planting beds. 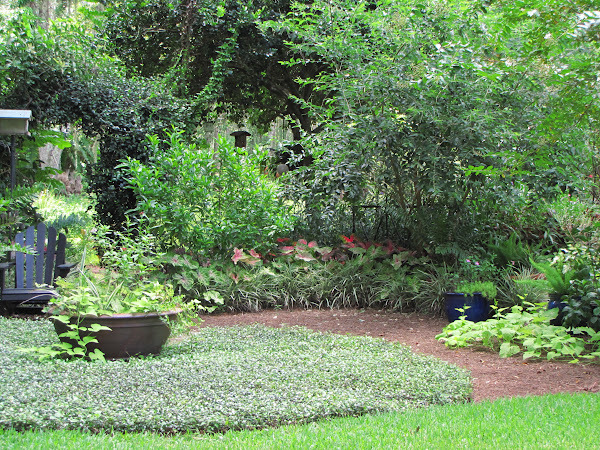 Winding borders or clumping arrangements of caladiums, planted from bulbs, weave among aztec grass, flax lily, agapanthus, ferns, lilies, gingers, grasses, and liriope perennials. They are a simple plant with an oh-so-easy-to-love quality. Once the bulbs are planted the leaves rocket out of the warm earth within a couple of weeks. After they sprout they require no special attention in Florida's climate. If planted in container gardens attention to watering needs will keep them happy. 'White Queen' is an old-time favorite of mine that likes partially sunny conditions. Its large white face with deep magenta veins blends just as well with evergreens as with annual coleus. I tuck them into as many nooks and crannies as possible. They add an exotic touch to the garden and provide a layer of lushness to the understory of the grand oak trees. 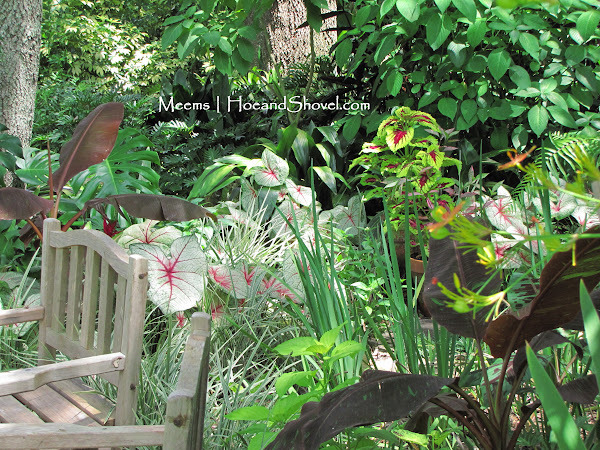 Caladiums perform as a substitute for flowers especially in my shade gardens. 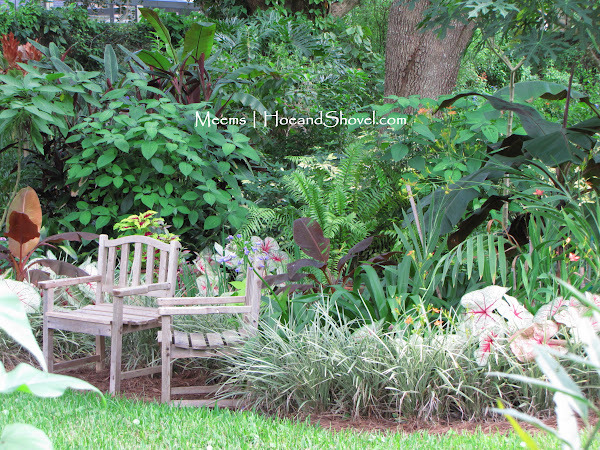 Isn't it great to find plants with pizzazz that do well in shady spots. Bright red, chartreuse, white, pink, and even bronze and almost black are just a few of the colors incorporated into a multitude of arrangements on the faces of heart-shaped foliage. An array of flecks, speckles, veins, and blotches appear in varying formations depending on the cultivar. A mix of *reds*~~ 'Red Flash in foreground/ 'Freida Hemple' in background~~ behind chairs. 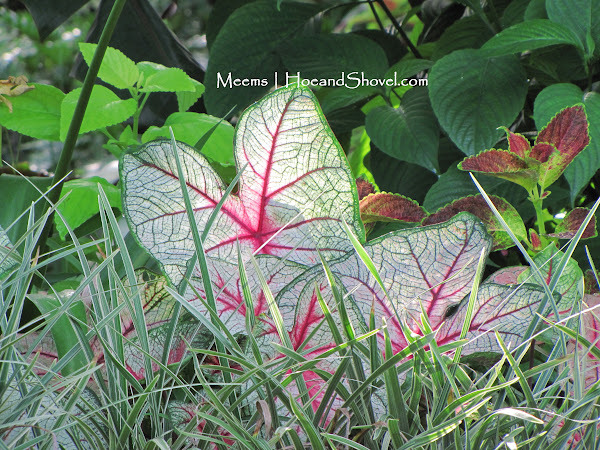 Well-draining, organic soil is preferred by caladiums to thrive, but they will also grow in sandy soil. An organic soil will hold the moisture they require while a sandy soil will need to be monitored more closely for sufficient irrigation. 'Red flash' and 'Miss Muffett' in foreground and 'Torchy' and 'Red Flash' in back ground. Florida receives an average of over 50 inches of rain a year. Caladiums are quite happy about this statistic since the majority of our rain falls during the summer. It's also a good thing for the rest of the garden, too, following our customary dry spring season. 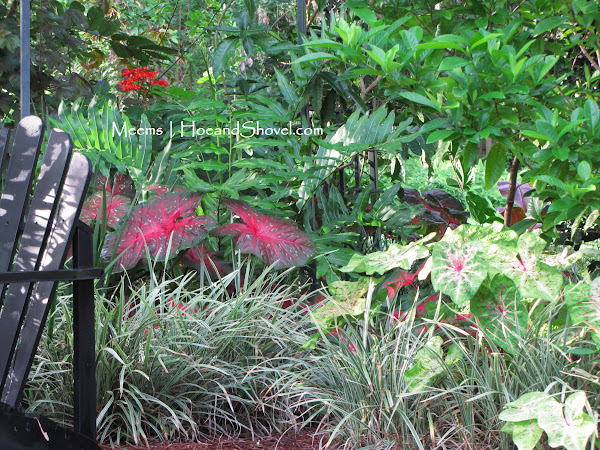 Since the greatest percentage of my garden is turf-free, caladiums are a fitting blend with Florida-Friendly ornamentals and native plants I've used as alternatives to grass. I decide what to plant and where to plant according to each variety's height, sun requirements, and color. There are endless combinations and possibilities with caladiums. Check the website at Classic Caladiums for an extensive supply and assortment of caladiums available both for sun and shade conditions. 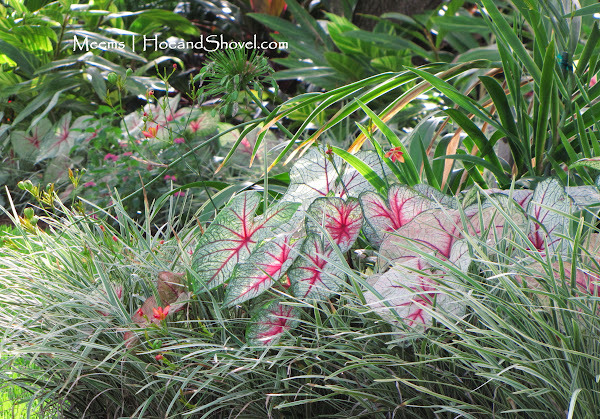 My summer garden is a festival of leafy color with caladiums as the stars of the dramatic show! Which caladiums are shining brightly in your garden this summer? ***My most recent Troy-Bilt article written for 'The Dirt' newsletter is out. 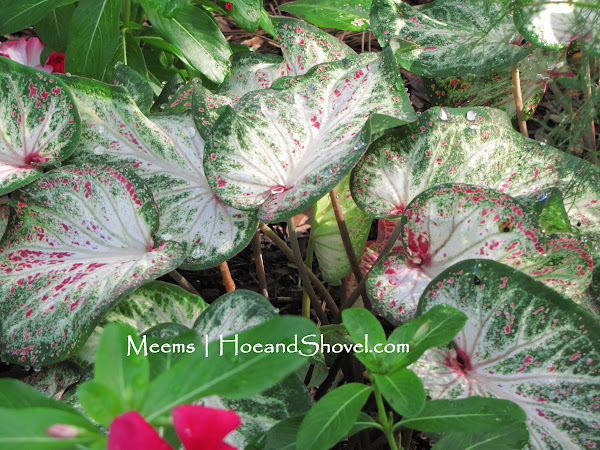 Click here to read "Caladiums Add Spectacular Color to Any Garden". ***Please visit Hoe and Shovel on Facebook and LIKE us to join in the discussions. We post almost daily there and would love to hear from you! I just love all of your caladiums Meems. 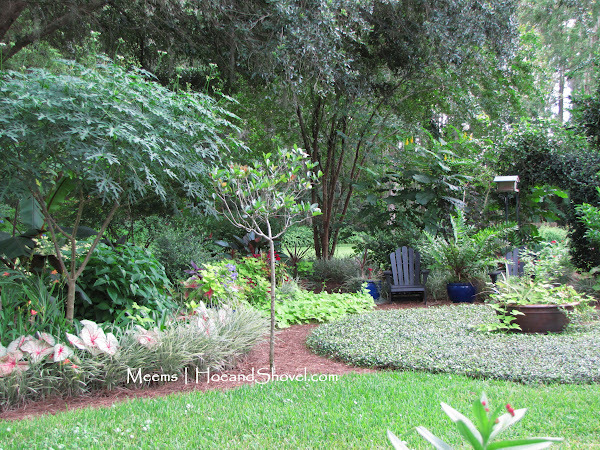 Your gardens are so lovely and peaceful, even in the heat and humidity that makes up our summers. I like your red flash and the peppermints. Enjoy all that beauty that surrounds you. Hope you get nothing but rain from Isaac. I treat caladiums as annuals here. I alwasys have a couple in pots. They are great in the shade here. I really enjoyed this post, Meems. I only have caladiums in pots right now, but maybe next year I will try some in the ground. Your garden is beautiful and so inspiring. I'm always excited to see new pictures. 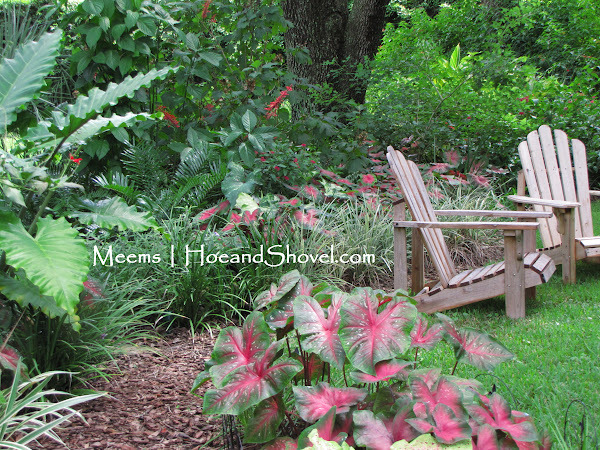 It's been quite awhile since I've visited, Meems, but when I think of your garden, I always think of caladiums. You have such a beautiful variety of them! I planted several in containers this year--so I would remember to dig them up. I usually buy the plants rather than the tubers, so I can see what they look like right away. My only problem with them is that I can never choose a favorite and always come home with more than I intended! My caladiums are going in leaps and bounds crowding out other plants in my FL panhandle garden, but I don't care, they are so bright and cheery. With all the rain we've been having, as you said, the summer is quite the ideal climate for them to flourish. Headed out to see if I can't find some caladiums today! I associate all Caldiums with Hoe and Shovel Meems. You always share the most beautiful arrangements with them. Believe it or not, my white ones returned from last year. Of course I added more at the beginning of spring. These are all lovely. Inspired by you, I ordered some caladium bulbs but they never showed up. Will try to get some next time I am in the States. Love the diverse varieties and the clever and subtle ways you have integrated them in your garden. You've given me ideas for next year on blending caladiums with other ornamentals in containers. I love caladiums and have since I was a very small girl. I am surprised that more people do not use them.